Keyboards and mice and monitors, oh my! 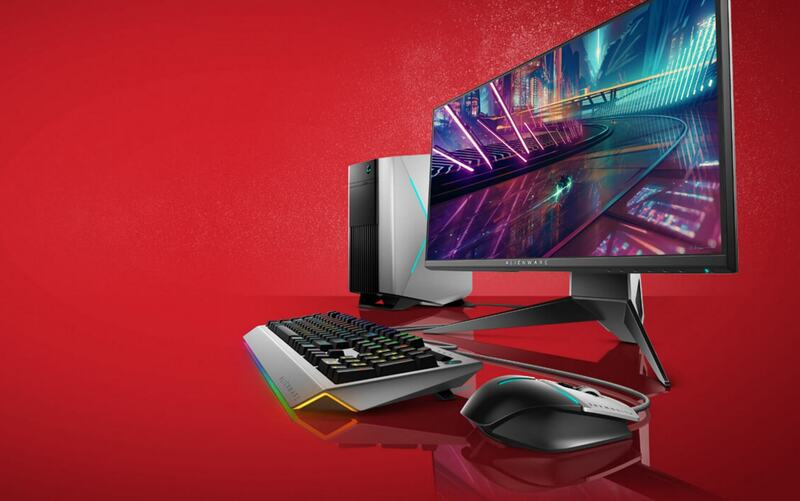 Not content with just making gaming computers, Dell is expanding their Alienware gaming hardware with a plethora of new peripherals to match their laptops and desktops. Today at E3, Dell announced new mechanical keyboards, monitors, and gaming mice. Even better, the Alienware Area 51 gaming desktop is being refreshed to include AMD’s Threadripper CPUs. The Alienware gaming mice allow players to switch the DPI on the fly to tailor the mouse movements to the style of game or change in gameplay. The $49 Alienware Advance Gaming Mouse can be configured with up to three different DPI levels while the $89 Elite Gaming Mouse is configurable up to five. The Elite Gaming Mouse is further enhanced by the ability to swap out the side grip and features a three-position palm rest. The Elite Gaming Mouse also has four weights inside that can be adjusted. Like the Alienware desktops and laptops, both the Elite and Advanced Gaming Mice have configurable RGB lighting. The new $89 Alienware Advanced Gaming Keyboard features a cornucopia of gaming centered niceties such as KaiHua switches, spring-loaded keys, anti-ghosting, and macro keys. If that wasn’t enough, there’s a second $119 Pro Gaming Keyboard with all of the same features as the Advanced model but with additional premium features such as a volume roller, onboard memory, and RGB backlighting. Of course, no proper PC gaming setup is complete without a monitor. Alienware is offering a new 24-inch gaming monitor (LCD TN panel, sorry IPS lovers) with a 1920 x 1080 resolution. That might sound a bit paltry with the current focus on 4K gaming, however it does have a 240Hz refresh rate and supports Nvidia G-Sync or AMD FreeSync technology. Prices vary from $499 to $699 depending on which synchronization technology is chosen (G-Sync or FreeSync). Finally, Dell will be the first to support AMD’s Threadripper CPUs and Intel’s Skylake CPUs inside its Area 51 gaming desktops. The Area 51 will allow up to three graphics cards to be installed. Dell has plenty of competition in the gaming peripheral space with Razer, HP, Logitech, and SteelSeries all offering premium (and in some cases more affordable) gaming hardware. We'll see how the market plays out once Alienware’s new peripherals go on sale June 13th.